A lot of people from Austin, Texas, and around the country have recently spent time at the Texas Capitol making their voices heard! All of that chanting, tweeting, and milling around can take a lot of energy, and while many Austin eateries have shown support, some activists with special dietary preferences may want to pack a lunch. 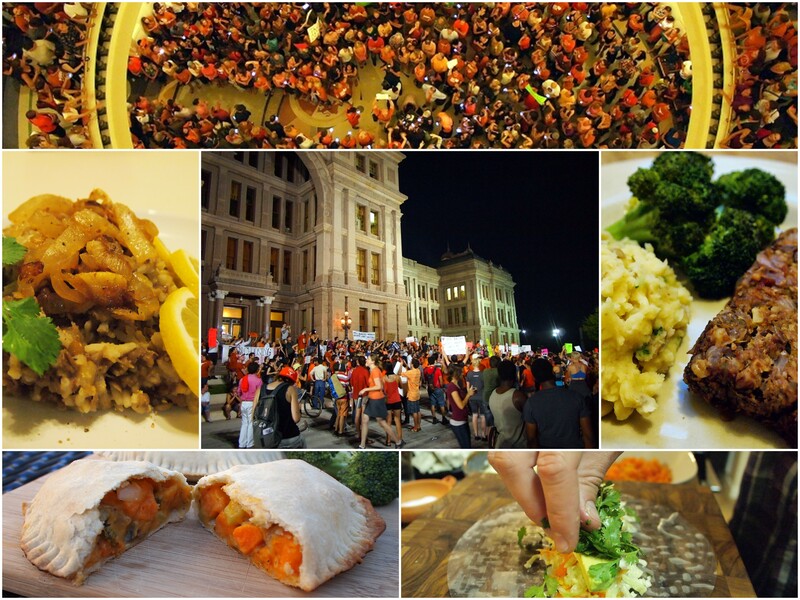 So in between donated goodies from East Side Pies and Tiff’s Treats, activists with a kitchen at their disposal may want to try these quick, nourishing, and durable recipes. Chickpea “Tuna” Salad – This is a versatile protein-packed vegan, gluten-free salad that packs well in a sandwich or with some crackers or carrot sticks. May Lentil Loaf – This takes a little more time to make, but I imagine it as a modern day loaves and fishes– if you bring a lentil loaf to a march or committee hearing you can feed yourself and your new closest 40 friends a hearty, delicious, energy-packed meal. Mujadara – More nutrient dense lentils! This middle eastern salad is good hot or cold and tastes great on its own, on salads, or in pita. 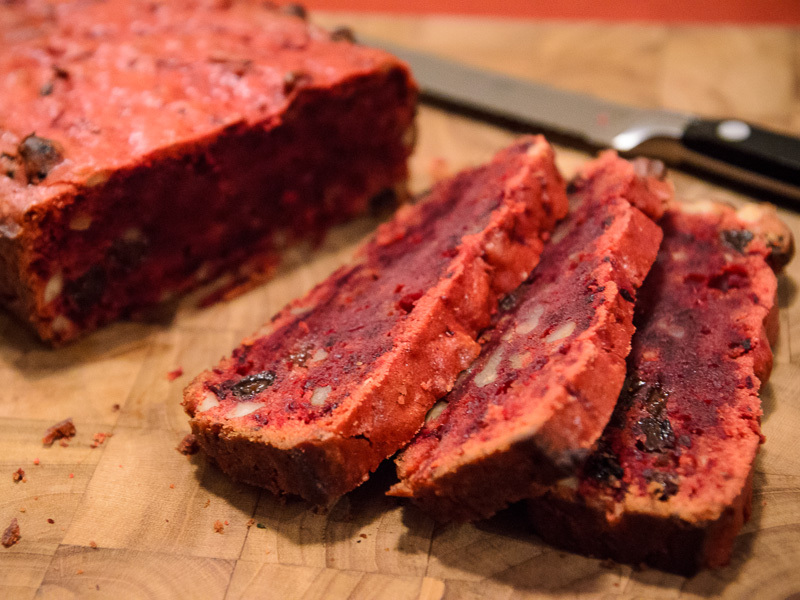 Blueberry Oat Protein Bars – This is a good one to have in your back pocket. Munch one before you link arms and you will be full and satisfied all the way to county lock up. Sweet Potato and Broccoli Pasties – This dish was traditionally made by women first thing in the morning for the menfolk heading off to the factories and mines. Maybe sometime in the next 30 days some helpful allies can whip these up for women marching off in the bowels of the capitol extension. Kabocha Squash and Quinoa Tamales with Aji – Tamales are great to-go foods and the squash (available now from Johnson’s Backyard Garden) helps keep the dough moist, adds a healthy veggie, and a delicious flavor. Quinoa Tabouli Salad – Quinoa is a super food for the wonder women (and men) that need all the help they can get. This salad will hold up will for several hours in a backpack. Consider pairing with the Mujadara in a pita pocket with some hummus and you’ll have what it takes to shout for days. Veggie Spring Rolls – Spring rolls are a great way to eat a lot of veggies. If you are packing them for lunch or a snack minimize the amount of liquid in the rolls. Don’t forget your protein-loaded peanut sauce. Barton Creek Market Bars – It will be hard to keep going without something sweet. These bars satisfy the need for a nice treat while still giving you the energy and nutrition your body (and cause) needs. Pistachio Biscotti – Biscotti are a great snack, pair well with your first (or fifth) coffee, and will last for days moving from the temperature differential of the South Lawn to the Senate Chamber. 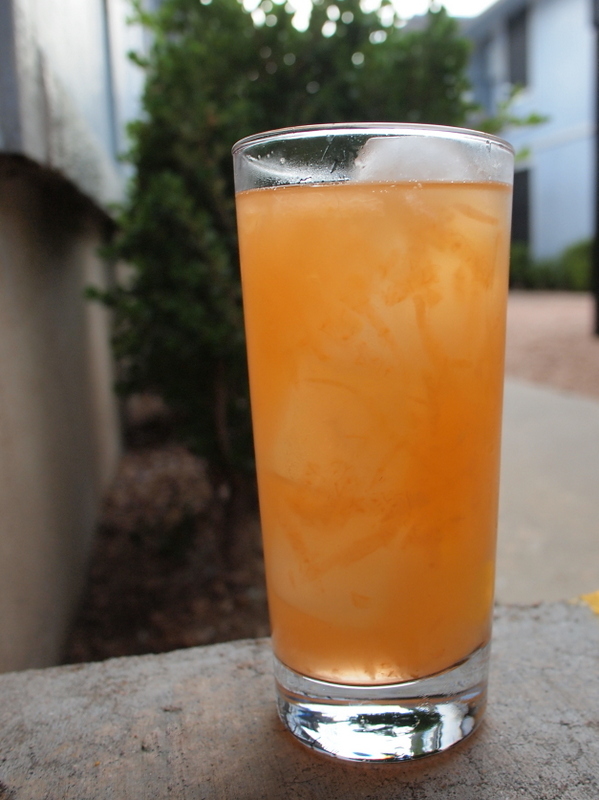 This tasty and simple beverage is actually something I learned back in high school. My good friend Patrick often invited me to his large Filipino family’s parties. These parties were some of my first experiences with real, homemade international foods. This cantaloupe drink was a treat at almost every gathering I remember. I never found out a special Tagalog name for this drink, so I’m calling it an aqua fresca for its similarity to the light Mexican beverages. 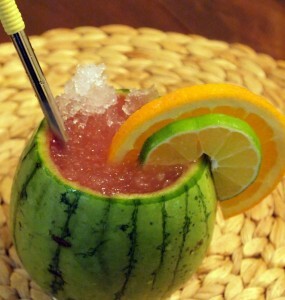 Either way, this melon juice a delicious and refreshing treat on hot summer days! Cut the cantaloupe in half, and scoop out seeds into a mesh strainer. Put the strainer over a large bowl so you can catch the juice that comes out. Peel the cantaloupe, then grate it using a cheese grater. Make sure to save any juice that is expressed during the grating. Dissolve the sugar in 2 cups of the water. Add about half of the grated cantaloupe to a large pitcher. Add the remaining cantaloupe to the strainer with the seeds, pour the sugar water over this, then use a large wooden spoon to press the flesh against the strainer, squeezing out as much juice as possible. Add all of this juice along along with the remaining water to the pitcher. Refrigerate until cold or serve with lots of ice! Last weekend AFBA members and attendees of BlogHer were invited to an event hosted by the National Mango Board. We had the opportunity to try some great mango based food and cocktails at Swift’s Attic and the Mango Board was kind enough to send us a box of mangoes! 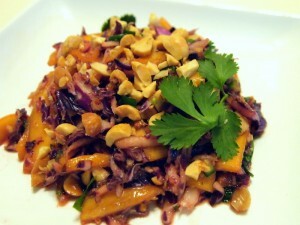 One of our gift mangoes was under-ripe which is a fantastic opportunity to create this classic southeast Asian salad. Combine mango, green onions, cabbage, peanuts, cilantro, hot and pepper in a large bowl. In a small mixing bowl, whisk together soy sauce, vegetarian fish sauce, sesame oil, key lime juice, and sugar. Add the dressing to the salad, tossing to combine. 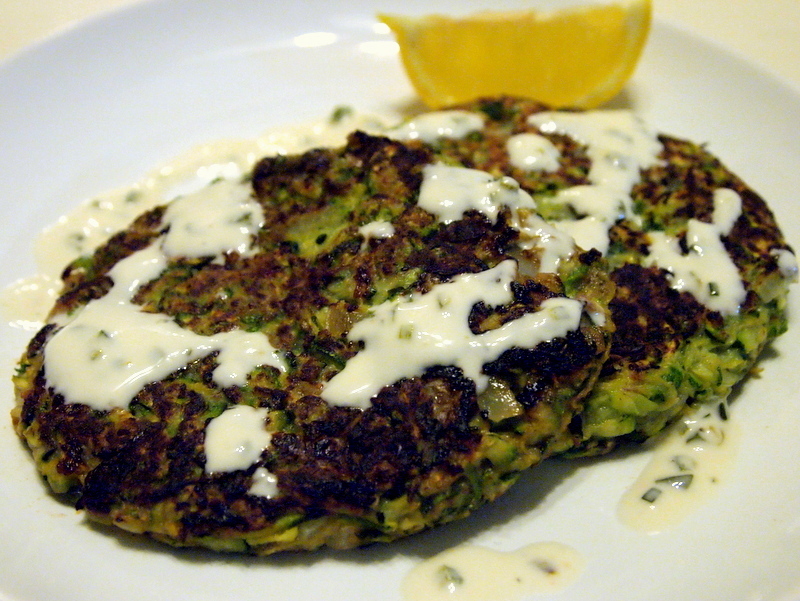 This recipe is inspired by the hash served by the excellent Broder in Portland. If you have some kind of fancy dicing tool, I highly recommend using it because dicing all those root veggies by hand is quite a task! In a large soup pot, heat 4 tablespoons olive oil over medium heat. Add diced root vegetables and onions and saute uncovered. Stir occasionally until vegetables are caramelized and tender, about 30 minutes. Add sage, remove from heat, and season with salt and pepper to taste. If you don’t have a large enough pot, feel free to do the hash in smaller batches, then reheat after all the batches are cooked. White the hash is cooking, heat remaining olive oil in a wok or soup pot over medium-high heat. 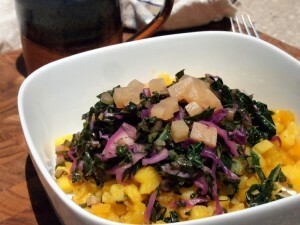 Add shredded dandelion greens, kale, and cabbage. Stir continuously until the greens reduce in volume by 2/3 and are tender, about 5 minutes. Finish with apple cider vinegar, remove from heat, season with salt and pepper, and set aside. When the hash is finished, serve topped with greens and pickled beets. This beet bread has a fantastic color and is great for dessert or a sweet breakfast. First, boil beets until fork soft. Run the cooked beets under cold water so you can peel them by hand, then grate until you have about 2 cups of grated beets. In a large bowl, combine oil, sugar, and egg replacer. Once combined, stir in vanilla, baking powder, salt, and cinnamon. Add flour and mix until the flour is completely incorporated. Fold grated beets, pecans, and raisins. Thoroughly coat a loaf pan with cooking spray, then pour in batter. Bake at 350 degrees Fahrenheit for about 45-50 minutes or until a toothpick inserted into the center comes out clean. Having trouble thinking up plans to treat Mom for Mothers’ Day (it’s coming up very soon – May 12)? How about preparing a nice picnic lunch at your local city or state park to enjoy the nice spring weather! The Texas Parks and Wildlife Division has put up some resources for to help plan your picnic in Texas State Parks. TPWD has even put together a page of picnic-friendly recipes, two of which from yours truly at Coseppi Kitchen! If you’re not in Texas, check your local state parks agency to find information about utilizing your local resources to have a great time outdoors! 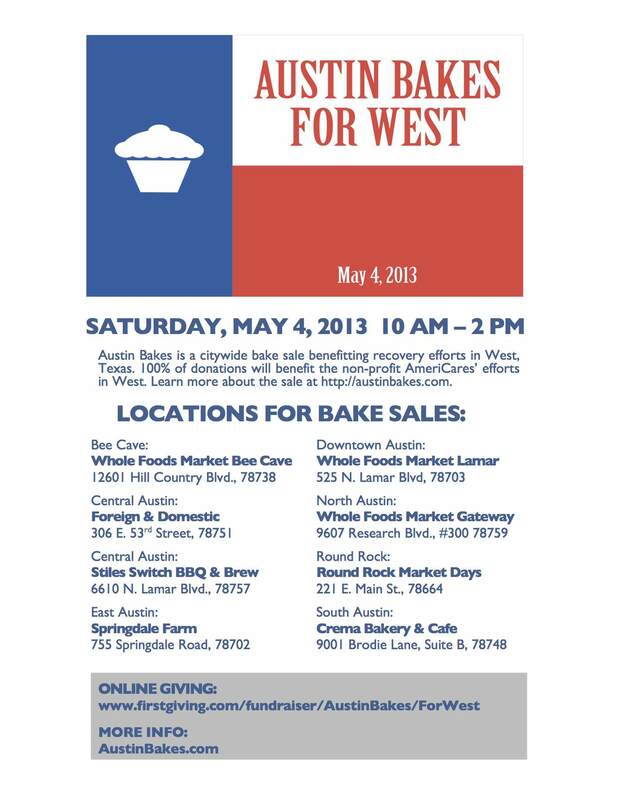 Austin Bakes is a citywide bake sale benefiting recovery efforts in West, Texas after the terrible fertilizer plant explosion that happened there on April 17. Home and professional bakers from around Austin will provide treats for the bake sale, happening at 8 locations (see flyer attached to this post) around town from 10AM until 2PM this Saturday, May 4. To get involved, visit www.austinbakes.com. Donations are also being accepted at FirstGiving before and during the bake sale.